OMG - he's HUGGING PETER! 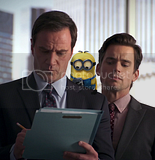 I can just imagine Neal doing something Peter disapproves of in the other room, so the minion is distracting him. OMG! Snuggly minion is snuggly! D'AWWW!!! I love, love, love your manips. They are absolutely hilarious! Who wouldn't want to get snuggly with Peter? LOL that's an awesome collection ! I think my favorite are Neal and the minion laughing and the one where they raise hand. These are too funny! I love them all! 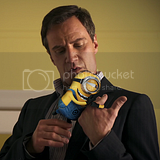 *hugs minions and Neal and Peter* Thank you for creating them and sharing them with us! ROFL! These are just brilliant. :D I can't even decide which is my fave--but, ohmygosh, the bananas! I selfishly hope they all make their way over to the new Minions crossover commm . . .
teehee! how adorably hilariously cute! xD LOLZ!